Democratic presidential contender Bernie Sanders has tapped several critics of Israel to advise him on foreign policy, including one who has compared Israelis to "Nazis" and accused them of waging "a Holocaust." Sanders, who is Jewish and had family members slaughtered during the Holocaust, recently disclosed that his top foreign policy advisers include J Street, a dovish Middle East advocacy group that backs some of Congress’ most vocal critics of Israel, former assistant Secretary of Defense Larry Korb, and James Zogby, an Israel detractor who heads the Arab American Institute. 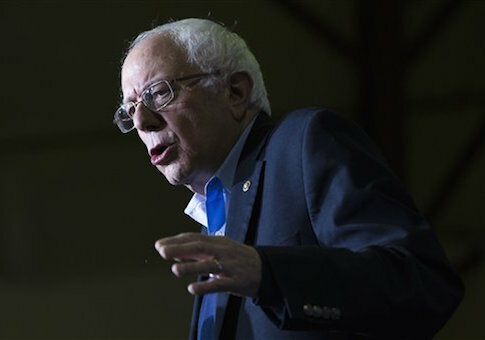 The inclusion of these advisers in the Sanders’ campaign, which has already come under fire for ignoring prominent Jewish-American political organizations, has prompted speculation from some that the presidential hopeful will pursue anti-Israel foreign policy priorities. "Bernie seems to care very little about foreign policy, and so his views are shaped inordinately by advisers," said Noah Pollak, executive director of the Emergency Committee for Israel, an advocacy organization. "And now we know who those advisers are. Two of them—Zogby and J Street—are leading anti-Israel apologists for terrorism. By his association with these extremist groups, Bernie fails the commander-in-chief test." A majority of voters, including Jewish ones, tend to pick a president who pursues policies supportive of the Jewish state, according to numerous polls. With wars still raging in the Middle East and the issue of Iran’s nuclear program still dominating the headlines, foreign policy and support for Israel could factor even more heavily into the 2016 election. Sanders tends to avoid foreign policy when stumping on the campaign trail, leading some to speculate that his advisers could play a major role in molding the potential president’s views. "If advisers are a crystal ball to the future of foreign policy, then Sanders seeks a policy which doubles down on many of the failed assumptions that have undercut Obama’s policies," said Michael Rubin, a former Pentagon adviser and terrorism analyst. "America’s adversaries are real and are motivated by ideology rather than grievance. To rest American national security on the good will of anti-American despots and Islamists is never a good gamble." Zogby has accused the Jewish state of committing a "Holocaust" against the Palestinians and has referred to Israelis as "Nazis." He has also described sitting members of Congress as "Israel firsters," an anti-Semitic trope that implies dual loyalty to the Jewish state. Zogby also has come under fire for exploiting the memory of the Holocaust for political purposes. Zogby claimed in a 2010 blog post for the Huffington Post that "the plight of Palestinians is to the Arabs, what the Holocaust is to Jews world-wide." His comparison immediately drew outrage, with researchers from the UK Media Watch organization describing it as "grievously insulting." "Nothing that I could say to highlight his words would make them any more insulting or horrid than they are on their own," a representative of that group wrote at the time. "Zogby has two goals: to make Arab Americans more powerful than Jewish Americans and to be their preeminent leader," Yehudit Barsky, a fellow at the Institute for the Study of Global Anti-Semitism and Policy, wrote in a profile about Zogby’s anti-Israel attitudes. J Street has faced similar criticism for its efforts to pressure Israel into making security concessions to the Palestinians that could endanger its survival. J Street accused the Jewish state of "fanning growing flames of anti-Semitism" due to its efforts to stop daily attacks on civilians during Israel’s 2014 battle against Hamas terrorists. The group’s leaders also have accused leading Israeli politicians of being racists. J Street, which lobbies in Congress, supports many leading critics of Israel and has worked to defeat the Jewish state’s defenders. Mainstream members of the pro-Israel community have repeatedly called on J Street to be isolated and excluded from the debate due to its extremist policies. A majority of voters also have expressed opposition to the Iran nuclear deal, one of J Street’s top priorities. Sanders also backs the deal. Korb, a Sanders adviser and top official at the Center for American Progress, lobbied in favor of the Iran deal and has said that military action against the Islamic Republic is not an option. "Sanders commitment to get foreign policy advice from these three folks is indicative that his time on a kibbutz in Israel did little else than to instill in him a love for farming," said Mark McNulty, the Republican Jewish Coalition's spokesman. "J Street and Zogby are more committed to tearing down our relationship with Israel than providing sound policy advice. The choice for Democrat Jews is stark and the more they learn the more a GOP candidate committed to restoring our place in the world is an attractive candidate." This entry was posted in National Security and tagged 2016 Election, Bernie Sanders, Israel. Bookmark the permalink.